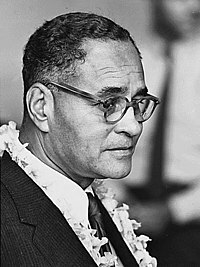 Ralph Bunche (7 August 1903 – 9 December 1971) was an American political scientist and diplomat. He received the Nobel Peace Prize in 1950. He won it for leading mediation (peace talks) in Palestine during the late 1940s. He was the first African American person to win the prize. Bunche was involved in the formation and administration of the United Nations. In 1963, he was awarded the Medal of Freedom by President John F. Kennedy. For more than twenty years, Bunche served as chairman of the Department of Political Science at Howard University (1928 to 1950). He also taught at the university. He served as a member of the Board of Overseers of Harvard Univesity (1960–1965), which is the university that he graduated from. He also served as a member of the board of the Institute of International Education, and as a trustee of Oberlin College, Lincoln University, and New Lincoln School. This page was last changed on 23 January 2014, at 19:15.